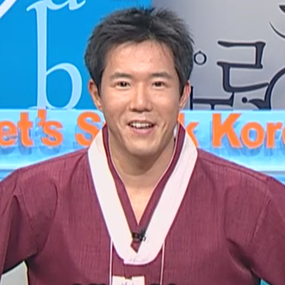 - ARIRANG TV Let’s Speak Korean Host. It’s great to have the opportunity to host such a fine program and to meet all of you. I’m sure you’re surprised to see some of the changes on Let’s Speak Korean, I hope you like them. We are all dedicated in bringing you quality education as well as an entertaining experience so I’m sure you’ll be happy with what LSK has up its sleeves. Born in Korea and having to immigrate to the US at an early age, I had to learn a brand new language and a new culture. It was difficult at first but I managed. The funny thing is when I came back to Korea I found I had to do the same thing all over again, except the other way around because I had forgotten almost all of my Korean. Through the years here in Korea, I picked up a few tips and tricks in learning the Korean language and I’ll try my best to pass it on to you. Through LSK you’ll be able to learn everything from basic to advanced Korean and all that you need to know about Korea both linguistically and culturally. If you ever have any questions and/or comments feel free to use the message board. That’s why it’s there.